Palli Karma-Sahayak Foundation (PKSF), an apex development organization, was established by the Government of Bangladesh (GoB) in May 1990, for sustainable poverty reduction through employment generation. PKSF in line with its mandate has always endeavored to satisfy the credit need of the poor people of the country. In this context, considering the unmet demand for the farmers’ community, who were not served by banks nor NGO/MFIs, PKSF, with the financial support of International Fund for Agricultural Development (IFAD) implemented a 5 years (2005-2011) project named “Microfinance for Marginal and Small Farmers Project (MFMSFP). The project was implemented through 35 Partner Organizations of PKSF in 113 Upazilas spread over 14 districts of the north-west and north-central Bangladesh. The project intended to improve livelihoods of poverty-stricken cash-starved marginal and small farmers by increasing and diversifying on and off farm production mainly by providing them access to microfinance services, building their capacity on adopting/adapting improved farm technologies and practices and linking them with markets and sources of technical services. Over the project’s lifetime, the Microfinance for Marginal and Small Farmers Project (MFMSFP) assisted more than 200,000 producers to become active microfinance clients. The majority of them are women who were previously excluded from microfinance coverage in Bangladesh. Today, innovative financing and agricultural technologies tested by the project have been made available to more than 800,000 marginal and small farmers across the country. 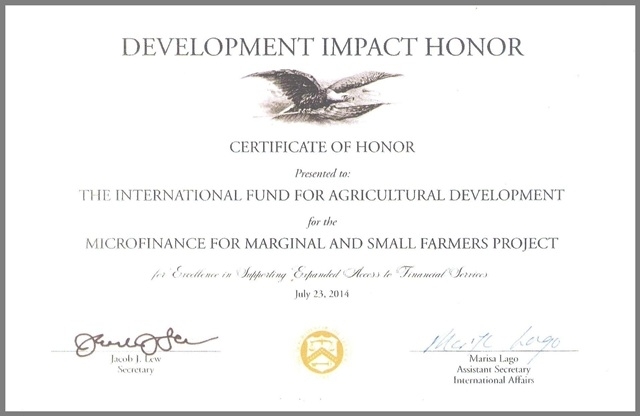 In recognition of work to give 200,000 marginal and small farmers in Bangladesh for excellence in supporting expanded access to vital financial services the United States Department of the Treasury selected the “Microfinance for Marginal and Small Farmers Project (MFMSFP)” as winner of “Development Impact Honors Award- 2014”. This award recognizes exceptional development projects supported by the Multilateral Development Banks. MFMSFP was one of only the six projects that were chosen for an award out of a large number of applications that were submitted from all over the world. Projects were judged competitively based upon their focus on priority sectors, innovation in overcoming previous difficulties, quality of preparation, focus on beneficiaries, quality of results, effectiveness of risk mitigation and generation of lessons learned. “We could not have done this without effective partnerships on the ground and especially without the farmers themselves, who were willing to try something new in order to improve their lives and those of others in their community”, said Golam Touhid, Project Coordinator of Palli Karma-Sahayak Foundation (PKSF). Nigel Brett, IFAD Country Programme Manager, accepted the award on behalf of Fund’s President Kanayo F Nwanze. It was presented by Jacob J. Lew, Secretary of the U.S. Treasury during a ceremony in Washington D.C. In accepting the award at a ceremony in Washington, D.C. on 23 July, IFAD highlighted the key role of PKSF in ensuring success. It was the commitment, the expertise, and the dedication of the PKSF and its staff that made the project a success and that led to lasting change for thousands of rural women and men. Hoonae Kim, Director, Asia and the Pacific congratulated Md. Abdul Karim, Managing Director of Palli Karma-Sahayak Foundation (PKSF) through a letter on the success of the MFMSFP project funded by IFAD.